A HEROIC naval officer’s Scarborough roots have been commemorated exactly 100 years to the day that the doomed Titanic liner struck an iceberg and later sank. Descendants of James Paul Moody – who was born at 17 Granville Road, South Cliff, in 1887 – unveiled a new blue plaque at his birthplace on Saturday. Kath Saville, who is one of the current residents at the address, said it was “fabulous” that he had been honoured and remembered. The 24-year-old was the sixth and youngest officer on RMS Titanic, which sank on April 15 1912. He was the man who answered the bridge phone from the lookout and uttered the now famous, yet fateful words: “Iceberg right ahead”. 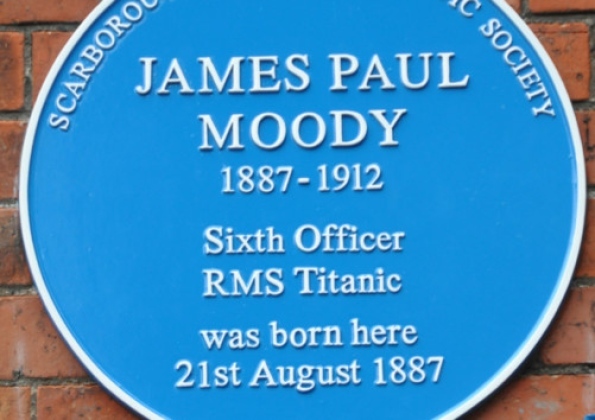 The blue plaque was provided by the Friends of HMS Conway – Moody attended the training ship HMS Conway from the age of 14 and later attended King Edward VII Nautical School in London where he passed his Masters Examination in April 1911. He was last seen by Second Of?cer Charles Lightoller trying to launch a collapsible boat at about 2.18am and he was the only junior of?cer to lose his life in the disaster. His sacrifice has also been marked on a monument in Woodlands Cemetery and another at St-Martin-on-the-Hill Church. Adrian Perry, of Scarborough Civic Society, said: "If ever there was a time to unveil this plaque, it is now. It is great that we can recognise people from Scarborough who had such amazing lives." He added that the society is very grateful to the Friends group for funding the plaque.